Breathing correctly is the most important part of yoga and meditation. EVITA is teaching a set of physical exercises and sequences designed to align the breathing, muscles, and bones. The postures are designed to open the many channels of the body, especially the main channels in the spine so that energy can flow freely. The focus is also on awakening the Kundalini energy through regular practice of meditation, pranayama, chanting mantra and yoga asana. Kundalini, called by practitioners "the yoga of awareness", aims "to cultivate the creative spiritual potential of a human to uphold values, speak truth and focus on the compassion and consciousness needed to serve and heal others. EVITA’s yoga classes are being held outdoors in the shade weather permitting. If not - we find somewhere inside/covered,,,will let you know! You are always welcome to “Keep it up” – warm regards EVITA! Time and Place: All most welcome! YOGA coming up: Monday at San Pedro beach, on Bora Boras wooden terrace at 11.30-13.00 och i Fuengirola på stranden nedanför Hotel Florida, 15.00-16.30. It it is raining, we do the yoga at Miadel. och i Sv kyrkan, om möjligt. Friday: Miadel 11.45-13.15 Calle Rio Volga no. 3a Nueva Andalucia. You can sit on a chair if you want to. Maybe some food and drinks after?! och i Svenska kyrkan i Fuengirola 15.00-16.30. Här finns oxå stolar. read more below and please let me know in advance. www.yogaevita.org 679 78 12 52, hugs Evita! Medtag gärna matta, kudde, handduk, och/eller filt. Inga förkunskaper behövs, samt kom gärna i GOD tid, tack! Monday classes Kundalini yoga. Fridays can vary a bit - welcome to ask. Wednesdays can be an alternative day for the other two, so stay informed. PLEASE book in advance with EVITA to make sure that place, day and time is available. Also so I can plan ahead. Let me know if you want to lend a mattress and/or cushion, always good to bring water. PRICES: 10 € per class. Private classes, 1 1/2 H, 40 € at Evita,s/50 € at clients home. Please pay in cash, thanks! Måndagar 15.00 på Cepastranden nedanför Hotel Florida, nära hamnen. Vi är öster eller väster om hamnen, beroende på vinden, så kolla närmare, kram! Medtag gärna matta, kudde, handduk, och/eller filt, samt 7/6/5 euros. Inga förkunskaper behövs - kom gärna i god tid, tack! Vi kan variera yogan, beroende på gruppen, så bara kom ock häng med på det som passar dig. Mer information på min hemsida, se nedan. If you have been considering starting a practice you are not alone. Many are turning to yoga as part of a healthy lifestyle. It helps to have a basic understanding of what to expect so you can focus on what’s going on in the class and what’s going on with your body. Here are 8 tips to help you not only survive, but thrive in your first yoga class and after, for the rest of your life! 1. Remember that yoga is a practice that meets you where you are. 2. Do your research to find a class that meets your needs. Please read my website. Read the class descriptions or call me to ask questions. There are many different styles of yoga so look for one that will meet your specific needs. Word of mouth is another way to find out, so ask your friends or people you meet at the class. Once you have settled on a class, arriving AT LEAST 15 minutes early will allow you to meet the teacher and inform about yourself and what you are hoping to accomplish by starting a yoga practice. As a regular, it also allows you to get your space and start to relax and prepare for the class. 4. It is best that you do not eat for some time before the class but do stay hydrated. If you’re digesting a meal, your body will be using energy that could otherwise be focused on your practice. Also, twisting and bending do not feel great with a full stomach! If possible wait about two hours after a meal and one hour after a light snack. Make sure you stay hydrated by drinking plenty of water. 5. Wear clothes in layers, that you feel comfortable in. Maybe some a little warmer, both for in- and outside. Depending on the class, you may be bending over, twisting, turning, stretching, and even inverting. Make sure you do not only wear comfortable but also that you are wearing something that will stay put! Please bring mat/cushion/blanket ( thick or thin, your choice), always nice for support, maybe a towel and some water. 7. Respect your body and its limits. Yoga is about self-acceptance and meeting yourself where you are with love and compassion. The slower you move, the faster you progress - to begin with. Finding your edge in each pose and continually staying with it as you breathe respects where you are and will allow you to move forward over time. 8. Stay open and enjoy the practice. Chose to go into your practice with an open heart and mind. Don’t judge the practice. Commit and keep going. During my first yoga class, I knew that something fundamentally right was happening. I did not understand what it was, but I knew I was where I needed to be. You deserve to connect and to communicate deeply with your body. You deserve to strengthen inside and out and most of all, you deserve to change all that is not serving you in your life. Yoga informs us about ourselves. The more we practice, the more information we will receive as we begin to watch, connect, and engage at deeper levels. It is through that connection and engagement that we can begin to transform our bodies, our minds, and our world – one practice at a time. Just Keep it up and Keep doing it. Hope to see you on and outside the mat, warm hugs Evita! Look for more pictures here > Tarifa = We can go there/here again, if you want to. Just let me know, when and who, hugs Evita! April 21-27, Sept 8-14, 2019. 945 €. Även på svenska, samt lite mer info nedan. This fantastic place is available for us. Let me know as soon as possible if you are joining. As always, it's about given and take. Don't miss this opportunity. Take it easy and I hope to see you soon, most welcome Evita! INFORMATION to make your stay as pleasant as possible. Do read it carefully, and don't hesitate to contact me if you have any questions. See contact details below. We practice yoga 2-3 times per day, totaling min four hours. In the morning an easy practice, focusing on breathing, stretching, with a more physical session in the afternoon. We spend the evenings together singing, laughing, meditating, and there will be several surprises! At least once we will heat up the big Swedish style sauna. Coffee/tea/water free of charge. Soft drinks available at extra cost. Recommendable no intake of alcohol. There will be opportunities to walk every day, together in a group or of course alone. Please bring comfortable shoes. Trainers are fine. If you wish we can arrange half a day to visit the historical town of Ronda and/or to the coast. We depart after breakfast and return for dinner and evening practice. The roads through the mountains are superb and easy to drive, but lots bend! The entire venue inside areas is smoke-free. The price is 945 euros in shared en-suite twin rooms. You are welcome to arrive at the center as from 3 pm on Sunday. We gather together at 6 pm with dinner. Please do come on time. Check out is next Saturday morning around 11 am. It's important to be aware that Molino del Rey is private property and not a hotel. Make sure that you have travel insurance for your time away. All rooms are en-suite, with warm/cold A/C, ceiling fans, comfortable beds, electric mattresses, hair dryers, kettles, and safes. The rooms beautifully prepared for your arrival, but there is no room service ie bed linen, towels etc are not renewed during your stay. Please bring your own towel to use by the pool & for the sauna. Delicious breakfast buffet and dinner HB is included in the price. The food is healthy and home cooked. Leftovers from the day before will be available for anyone who gets hungry between meals. If you wish to arrive early or stay longer in Spain to see other places and sights I will be very happy to help. Evita håller yogakurser på Molino del Rey i södra Spanien..
Många tror att det där med yoga är en stor grej, att man måste förändra så mycket och sluta med en massa saker. Istället är det "enkelt" att lägga till då du har det mesta inom dig och behöver bara lära dig tekniken för att uppleva fantastisk glädje och energi. 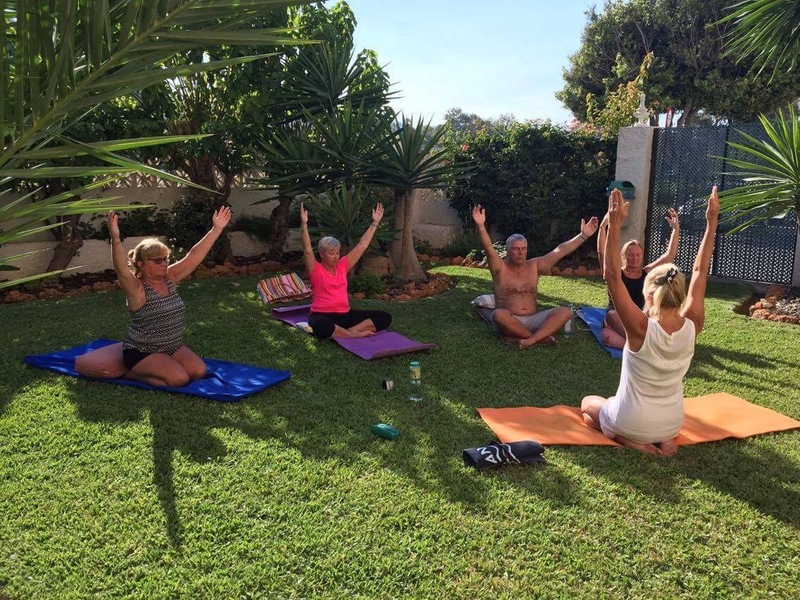 Evita som är yogalärare och verksam på Costa del Sol sedan mer än femton år, beskriver Molino del Rey som den bästa yogaplatsen hon varit på. – Den är total, de har tänkt på allt, från de sköna sängarna och stjärnorna i taket när du släcker lampan, till den fantastiskt goda vegetariska maten. Under kursen finns förutom själva yogan också möjlighet till olika slags behandlingar, vandringar, bastubad och bad i saltvattenspoolen. Evita beskriver den härliga luften, allt rinnande vatten och energin som omger platsen. – "Här mår jag så bra att jag svävar på moln"! Många av deltagarna är svenskar från Sverige som väljer en lite annorlunda semester och en del kombinerar med några dagar på Solkusten, kanske golfar, gör utflykter eller njuter av sol o bad. Ibland är kursen på engelska, då anmälningar även kan komma från olika delar av världen. Kursen är en "nybörjar"kurs, som enligt Evita fungerar givetvis utmärkt som “tusenmilaservice” för att rensa och fylla på med nytt även för dem som yogar regelbundet. Som alltid inom yogan, gäller det att "Keep it up". – Det är en otrolig uppladdning av inre upplevelser/energi och samtidigt en nedladdning när det gäller stressen. – Vi använder inga pekpinnar, det handlar inte om att vara duktig, utan var och en gör efter sin förmåga. Priset är 945 euros för boende, del i dubbelrum och dagarna fylls med yoga, meditation, naturupplevelser, historieberättande, samt mycket skratt. See the invitation here: https://t.e2ma.net/webview/3qpukd/c9fad37721fa28faca32a0584402d217 copy and paste, please. Peru is a country that has it all. Its ancestral heritage gives us the chance to admire countless archaeological treasures. Its land is natural and pristine containing much of the world's biodiversity within its borders. But above all, the warm hearts of its people allow the soul of the travelers to get in touch with the country. Peru is also a land of contrasts. The contrast of geography in which we can find 84 of the 104 life zones existing on the planet. The contrast of people, traditions, and culture as a result of the waves of migration that have occurred throughout its history. The contrast of colors, sounds and landscapes from the vast desert coast to the greatness of the Pacific Ocean and giant sand dunes to the Andean highlands with its snowy peaks, glaciers, and lagoons and down to the Amazon Rainforest which is rich in wildlife, plants, and numerous endangered species. Almost like a continent in miniature, Peru will astound you. This exciting adventure is hosted by EVITA - Eva Lindblom in partnership with Rainforest Reef Escape. We have put together an invigorating journey that will take you from the sand dunes of the Ica desert to the Sacred Valley of the Incas. Together we will explore the immense beauty of the Peruvian culture, push our limits on exciting tours and activities and deepen our yoga/meditation practice fully immersed within this sacred landscape. Discover the Pisco Vineyards and the “Arabian-like” landscape of the Huacachina Oasis where you can sandboard in the endless sand dunes of the Ica desert. Enjoy a boat tour of the Ballestas Islands otherwise known as the “little Galapagos” of Peru, because of the great variety of marine wildlife that inhabits them. Take a guided tour of the Paracas Reserve home of the Andean flamingos. Visit Cusco located at over 11,000ft above sea level and enjoy a complete tour of this ancient Inca capital. From there you’ll visit the Sacred Valley and all of its wonders including a tour of the famous Machu Picchu. Not to mention yoga along the way! Spots are limited to 10 adventurous souls that will join us on this unique and exciting Peruvian Yoga Escape. Every day we will be exploring and discovering the beauty of Peru and, in the Sacred Valley, you can follow energizing yoga and meditation sessions as well as relaxing Yoga Nidra sessions with EVITA our fab yoga leader. You will be staying in a variety of lovely hotels in Lima, Cusco, Ica, Aguas Calientes and in the Sacred Valley. More information about the hotels will be sent to you once we confirm the dates of your adventure retreat! As for your meals, Peruvian cuisine is recognized around the world as one of the best in South America. Peru’s amazing cuisine has evolved from both local and immigrant traditions. Foods that were prepared by ancient civilizations are still enjoyed today, while typical Peruvian dishes also benefit from European, African and Asian influences. Peru's geography yields diverse ingredients: abundant seafood from the coast, tropical fruits from the jungle, and unusual varieties of grains and potatoes from the Andes. View our trip details.